Some backup offensive linemen got some work with the starters for Wyoming during Tuesday morning’s practice at Jonah Field at War Memorial Stadium. Redshirt freshman Chase Roullier continued to get reps at left guard for senior Tyler Strong, who missed last week’s game with Northern Colorado and is listed as questionable for Saturday night’s game at Air Force. Roullier started for Strong last week. Sophomore Austin Traphagan got some snaps at left guard for sophomore starter Jake Jones, who appeared to suffer a minor injury in Tuesday’s practice. Traphagan is listed as a backup tackle, but also has played guard at UW. Redshirt freshman walk-on Josh Teeter also got a few snaps at guard. Sophomore center Rafe Kiely continues to alternate snaps with junior starter Albert Perez. Perez has started the first three games, and is slated to do so at Air Force. About an hour prior to kickoff here in Laramie and it is partly sunny/cloudy, temperatures in the mid to high 60s and everything is dry around here. Laramie didn’t get the rain like Cheyenne or parts of Colorado did the last few days. There is chances of rain this afternoon, but the elements should not be a factor early on … if at all today. –Junior quarterback Brett Smith is one touchdown pass shy of tying Casey Bramlet (2000-03) for the most in school history at 56. Today’s game will be Smith’s 26th game. Smith also is 273 total yards shy of moving into third place on UW’s career offense list and 317 passing yards from moving into fourth place in career passing yards. 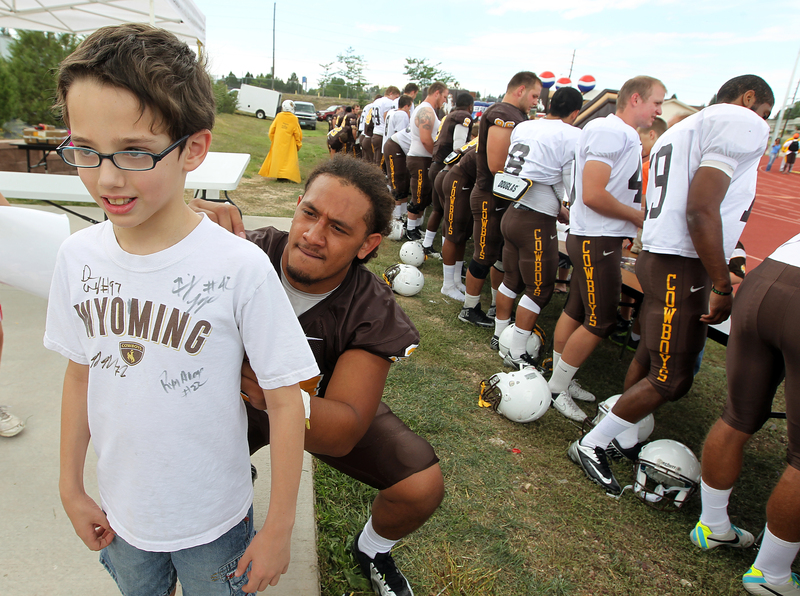 To me, the day belonged to the defense in Wyoming’s 42-10 home-opening win over Idaho Saturday. Eight tackles for loss, seven quarterback sacks, seven three-and-outs, four straight to start the game and two turnovers that led to touchdowns. Granted, Idaho wasn’t very good but the defense set the tone for this win as the offense struggled to get going. The 344 yards of total offense allowed was the fewest UW has given up since Nov. 19, 2011 against New Mexico (396). Here’s what coach Dave Christensen had to say about the defense, and about the game in general. I get into the defense more in my column in Sunday’s Wyoming Tribune Eagle and Laramie Boomerang, and also at wyosports.net. 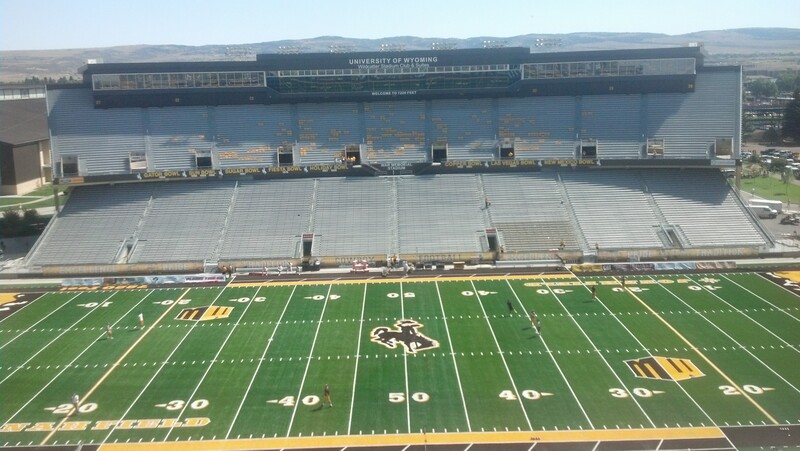 It’s a beautiful day here in Laramie for Wyoming’s home-opener against Idaho. Temperatures should be in the low 80s at kickoff and in the 70s by game’s end. Beats the heat and humidity at Nebraska last week. No new injury news, other than junior cornerback Tyran Finley is out for this game after being hurt late in the Nebraska game. No big surprise there as Finley was on crutches on Tuesday and Wednesday. True freshman Tim Hayes will start in place of Finley. –UW has won nine of its last 10 home openers, and coach Dave Christensen is 3-1 in home openers with the Cowboys. Wyoming junior quarterback Brett Smith talks about the Cowboys’ home-opener against Idaho today, and looks back at UW’s 37-34 loss at No. 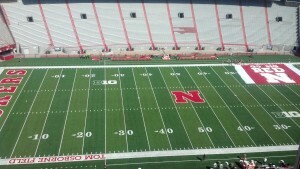 18 Nebraska on Aug. 31. The interview was done on Monday, Sept. 2, 2013 in Laramie, Wyo. It’s a hot one here in Lincoln. Driving into the stadium a bank sign said it was 102 degrees nearly four hours before kickoff. It won’t be that hot at kickoff, but it will be in the high 80s to low 90s. 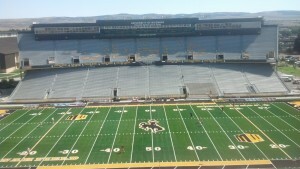 The good news for Wyoming is its bench will be in the shadows on the west side of the stadium. –Junior quarterback has not thrown an interception in his last 174 pass attempts, which is tied for the longest streak entering this season among returning quarterbacks in the Football Bowl Subdivision with Central Florida’s Bake Bortles. Smith is five more completions shy of breaking the MW record held by UW’s Casey Bramlet (2000-03) of 178. –UW is 74-40-2 all-time in season-openers; 19-23-1 in season-opening road games and 14-14 in season-opening road games against non-conference foes. –This is UW’s second straight season-opener on the road — both against top 25 teams — and only its third opener on the road since 2005. The Cowboys opened with a 37-17 loss at then No. 15 Texas last season. –UW is 0-5 against Nebraska and has been outscored in those games 241-83. –UW is 0-12 against ranked foes as coach Dave Christensen enters his fifth season. –UW is 1-15 all-time against Big Ten teams. The lone win was at Wisconsin, 21-12, on Sept. 27, 1986. –UW had a plus-7 turnover ratio last season. It had a positive ratio in its last four games, and it won three of them. It had a negative ratio twice — in the first two games — where it lost. It was 0-4 last season when that ratio was even. –Smith is one TD pass shy of tying Tom Corontzos (1988-91) for third place on its career list. Smith has 47 TD passes right now. –Smith needs 336 yards of total offense to move into a tie for fourth place with quarterback Josh Walwork (1995-96) on the school’s career list. Smith has 6,417; Walwork has 6,753. –Junior receiver Robert Herron’s next touchdown reception will give him 12 for his career, and put him in a four-way tie for ninth place on the school’s career list. The others are Chris McNeill (2009-12), Freddie Dussett (1986-88) and Allyn Griffin (1981, 1983-85). 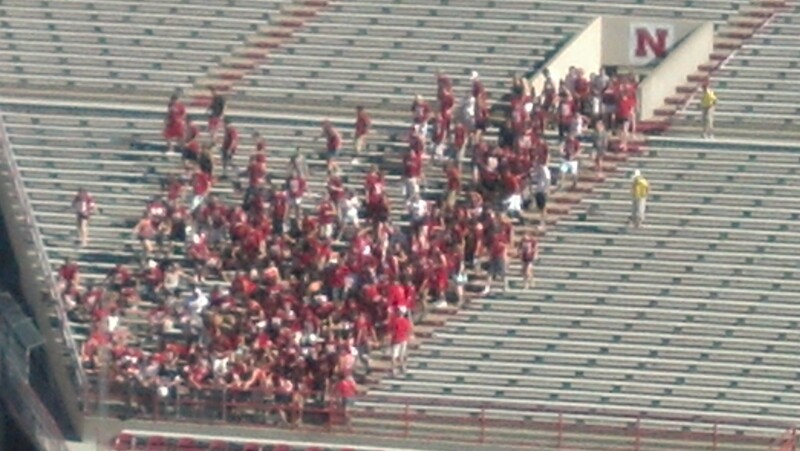 –This will be Nebraska’s 327th consecutive sellout, an NCAA record. It also is shooting for its 28th straight season-opening win. The Cornhuskers have scored 40 or more points in 20 of the last 27 openers, and limited its foes to 14 points or less 18 times. Wyoming junior quarterback Brett Smith is one of four offensive players on this year’s squad that started in the 2011 game with Nebraska in Laramie, which the Cowboys lost 38-14. The others are senior running back Brandon Miller, senior offensive guard Tyler Strong and senior tight end Spencer Bruce. Ironically, those three players also are scheduled to start when UW plays at No. 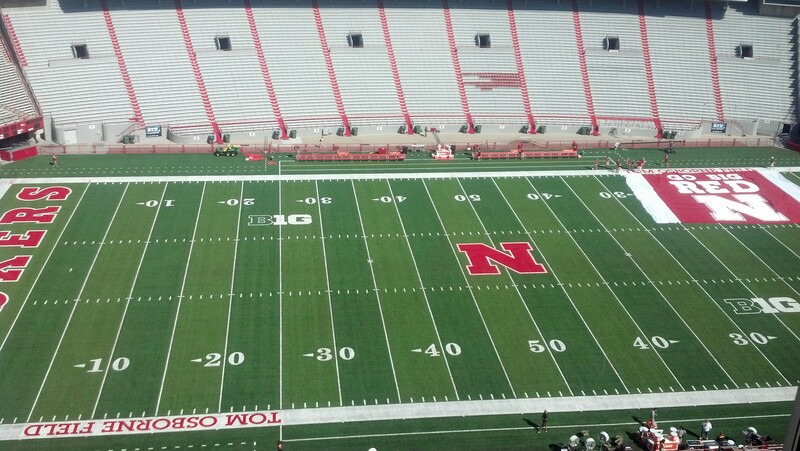 18 Nebraska Saturday in the season-opener for both squads. A true freshman then, Smith completed 17 of 33 passes for 166 yards with two touchdowns and one interception. Nebraska coach Bo Pelini thought Wyoming quarterback Brett Smith played well against his team. Wyoming’s first depth chart of the season for Saturday’s game at Nebraska came out Monday, and there were not a lot of surprises. –True freshman receiver Tanner Gentry will start at one of the four receiver spots. Gentry rapidly climbed up the depth chart throughout fall camp. He beat out junior Trey Norman. –Senior Robert Herron, juniors Dominic Rufran and Jalen Claiborne are the other starting receivers. Others listed on the depth chart this week are redshirt freshmen Eric Nzeocha, Nico Brown, Trent Sewell, Tanner Simpson and Jake Maulhardt; senior Jarrod Darden (a transfer from Colorado), and juniors Keenan Montgomery, Norman and Justin Berger. –Junior-college transfer Tyran Finley will start at cornerback opposite of junior Blair Burns. Not a surprise there since the injury to junior DeAndre Jones midway through camp. –Three of the four backups at the cornerback and safety positions are manned by guys who have never played a game at UW. True freshman Tim Hayes is behind Burns at one cornerback spot. Redshirt freshman Cortland Fort, who has gone back and forth from cornerback and safety, is behind Finley. True freshman Xavier Lewis is the backup at strong safety behind junior Darrenn White. Jones, who was the starter at cornerback when fall camp started before he was injured, is the backup for senior Marqueston Huff at free safety. Wyoming’s football team used one of its practices to prepare for its season-opener a week from today at No. 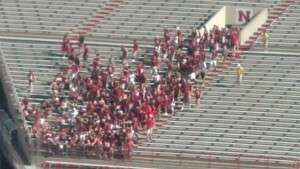 18 Nebraska to show the fans in Cheyenne what it has. Dubbed as the “Cowboys in the Capital,” UW practiced for about two hours at Cheyenne Central’s Riske Field. Between 1,500 and 2,000 people attended the event. Players and coaches signed autographs after practice. It was a good outreach effort by UW, and one of the first major efforts from the football program in quite some time. It makes sense to come to Cheyenne as it has more than 8,000 UW alumns living there. The players also seemed to enjoy it. 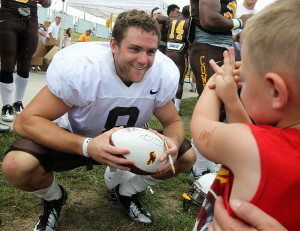 Wyoming coach Dave Christensen will release his first depth chart of the season Monday. But I thought I would take a shot of predicting how it will look now, starting with the offense. Look for the defense and special teams to come later this weekend. As always, I welcome your comments, thoughts and questions. Notes: There was never a doubt Smith would be the starter. In three fall camp scrimmages Smith was 39-55 for 553 yards with nine TDs and one INT. … Thompson also had a solid camp. He was 33-49 for 440 yards with four TDs and two INTs. … There was good competition at the No. 3 spot. I give Kirkegaard the edge based on his experience, but it would not surprise me if Thornton is No. 3 on Monday.